Steven Wright is 33 years old, which is a larger number than the total number of innings he threw last season. When your age exceeds your innings pitched, that’s officially not a good sign. Another bad sign would be an ERA greater than the number of innings thrown. Fortunately for Wright, he managed 24 innings before knee surgery ended his 2017 season, and his ERA was 8.25 at the time, so he survived that particular ignominy. Still the total package — low innings, high ERA, and age — was not a good or promising one. Then there was his arrest on domestic violence charges. The charges are in the process of being dropped, but…still…ugh. Very very ugh. That’s your introduction to Steven Wright’s last season! Yet, despite the arrest, despite the surgery, despite the lousy performance last season, there is a very real chance that Steven Wright will be the Red Sox number five starting pitcher in the 2018 season. Is that good? Is that bad? Should it even be happening? To find something that went right for Wright, you have to skip last season. Go back to 2016 when Wright threw 156 innings for the Red Sox with an ERA of 3.33. He was quite good then! And especially in the first half when he made the All-Star team. Coming in to the 2017 season Wright was expected to hold down a rotation spot… aaaaaand that concludes everything that went right for Steven Wright in 2017! Fine. Whatever. See if I come to your office and clap for you when you finish that memo. Wright lasted five starts into the season before getting shut down with discomfort in his left knee. It was initially thought to be a short-term injury, and he was put on the 10-day disabled list, but that eventually morphed into the 60-day DL and season-ending knee surgery. That was it. That was the end of Wright’s season. Five starts. Five lousy starts. Five crappy, lousy starts. It’s difficult to take much away from Wright’s work in 2017. He was bad (the aforementioned 8.25 ERA), but he had also been bothered by his knee since spring training. Perhaps in a world where his knee was healthy he would have pitched more effectively. Perhaps in a world where his knee was healthy we’d all be eating muscle-building jelly-beans in a field with unicorns. When you look at it that way it’s really a shame he hurt is knee, right? In any case, Wright’s season was essentially a washout. This is where things get interesting. The Red Sox already have Chris Sale, Drew Pomeranz, and Rick Porcello. They also have Eduardo Rodriguez and David Price, two pitchers who might be healthy and good, might be healthy and not good, or might not be healthy at all. In a perfect Red Sox season (cough2013cough), Wright wouldn’t touch the mound in the first inning all year, except maybe by accident while walking out to the bullpen before the game started. Except we all know that perfect seasons come along extremely infrequently — unless you’re the Yankees where 24-year-olds who were crap in Triple-A are MVP candidates and 3,000 pound 37-year-old pitchers with chronic knee problems are borderline Cy Young candidates. My point: it’s likely the Red Sox will need Wright on the mound as a starter at some point. Given the injuries the 2018 Red Sox starting staff has already suffered — and we’re still about two months from spring training — 150 or so innings of 3.50 ERA ball would be a godsend to this team. It doesn’t sound wholly out of the realm of possibility for Wright to replicate something in that vicinity in 2018, either. He’s clearly got it in him. His 2016 season wasn’t full of BABIP luck or a ridiculously lucky home run rate or anything like that. Wright pitched fine and the results were fine. He could absolutely do that again in 2018, and the Red Sox would be all the better for it. But knuckleball pitchers are like the weather. We study it and study it, and we’d like to think we can predict with some accuracy what will happen. Then we look outside on a day we thought would be 70 degrees and sunny and we find it’s snowing. Despite the awful 2017 season and the injury, Wright might well be a huge asset to the 2018 Red Sox. He could be the best sixth starter in the league, and a legitimate fireman who can give you two or three innings from the bullpen when the rest of the rotation is healthy and the pen needs a breather. Or he could be bad and get injured for the third season in a row. 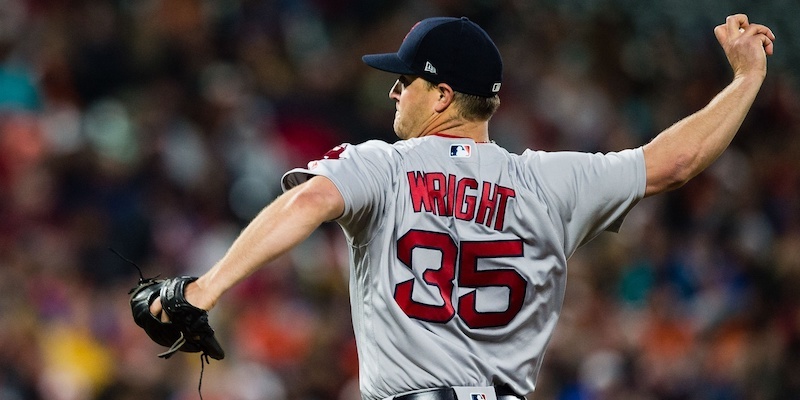 Given the odd proclivities of the knuckleball, and the strange up-and-down that Wright has seen in just a few years time, neither scenario playing out should be surprising. Perhaps a more modest goal, like keeping his ERA below his innings pitched totals, should be set. Spring training is two months away? I sure hope not! Lol. Just weeks, now, too ST.
Guaranteed that Wright’s fast knuckleball is already fluttering strikes in some bullpen somewhere. If NYFMLB doesn’t penalize him (and the team) for something that has already been dropped in Court, then he should, once again, start the season by helping the team win a game in Tampa or Miami. He is singlemindedly determined to be in the Majors, for the Red Sox, in the mold of Wake, for the foreseeable future; perhaps as a stable force through 2025. He has clearly demonstrated the ability, when healthy, to do so. He is, again, healthy. His salary and roles have been agreed to. In just a few weeks we will know if he will be allowed to play and, if so, how ready he is to succeed.